The weather and fashion go hand in hand. Every year, they change. And on a daily basis, they both influence each other. As summer comes to a close, the weather is starting to become cooler. While Fall isn’t my favorite season, I do enjoy shopping for clothes and accessories to make my style transition into long sleeves, knits and pants. This summer, I was a dress/skirt gal. But since Hurricane Irene hit NJ, I’ve been wearing my jeans again. But what about all your summer clothes? How do you get your monies worth for Fall, without leaving your summer duds behind? All of these items from H&M can be worn in the summer. But with right right fall wardrobe alternatives, they make the transition effortlessly into cooler weather. 1. While skirts and dresses can always be donned in colder weather, you won’t see many people wearing shorts. Yes, some ladies like to wear tights under em, but I stop buying shorts in August. UNLESS they are on sale and dirt cheap, I say save your pennies for skirts that you can wear year-round. 2. Tanks and tees can always be worn under cardigans, blazers and sweaters. This season, expect to see a lot of chunky, open knit sweaters… Basic tees, camisoles and tanks come in handy here. Which leads me to cardigans…. 3. Cardigans (like the one I found on shopsosie.com) and button-front shirts are universal weather-wearers. Not only can you throw em on when the summer wind picks up, but you’ll be ahead of the game in fall when the weather turns cold. 4. Try not to fall into the summer trend trap too late in the game. If you haven’t caught on by July, then wait till next season. I’ve seen an over abundance of knit short sleeve sweaters this year – even in June and July. Think about it: When it’s 90 degrees out, are you really gunna wear layers? Doubt it. Make smart fashion choices that benefit your wallet. 5. Opt for shoes that can be worn throughout multiple seasons. Closed toe shoes, that show a little skin will keep your tootsies warm in the Fall, but keep you looking stylish in the summer. I personally love the Makeelo platform by Sabine… Totally investing in these. 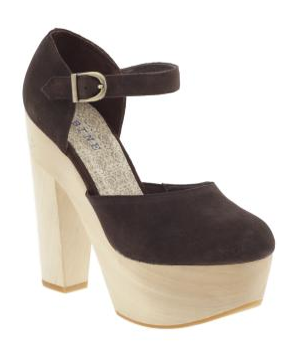 Plus, they look sorta like the Chloe Sevigny for Opening Ceremony ones, at half the price!